In the gold-rich California of the mid-1800s, native Spaniards are preyed upon by ruthless men taking advantage of unjust laws. 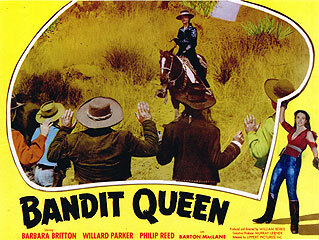 Vowing to avenge her parents' murder, Barbara Britton becomes a Robin Hood of the badlands, returning stolen gold to its rightful owners. Philip Reed co-stars as a SECOND masked raider, equally determined to bring justice to the Sierras.